Hover your mouse over the picture for an enlarged view. 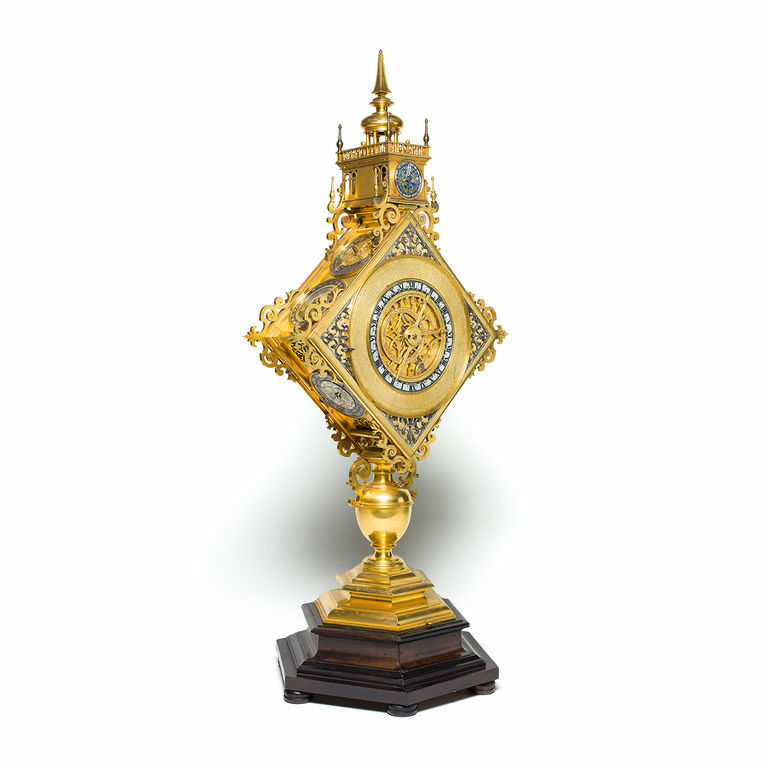 This ornate astronomical clock in the shape of a monstrance is an outstanding example of the watchmaker’s art. The face represents the firmament, criss-crossed with lines of the celestial sphere. Mapped on this lacy web, the fixed stars circle 366 times a year, indicating their position. The sun hand moves through the zodiac once a year. The point where the sun hand intersects the outer edge of the zodiac ring indicates the sign of the zodiac, the month and also – on the horizontal line – sunrise and sunset, while the moon hand indicates the lunar phase. In addition, the clock shows future eclipses of the moon and the sun, as well as astrological constellations and feast days. The dials on the narrow sides are for astronomical calendar purposes. 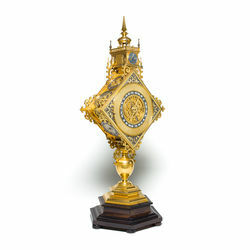 The ornate astronomical monstrance clock is a permanent exhibit in the Konrad Kellenberger Collection. 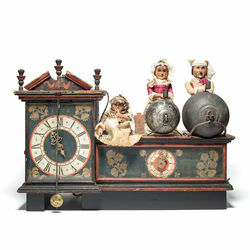 To date no comparable Swiss wooden wheel clocks with entire dolls as figure automatons are known to exist. This is an absolutely unique specimen, which may have been owned by a miller’s family. The manufacturer of the clock seems to have been a very skilled craftsman with a knowledge of mills who created a clock for this particular family. Movement with verge escapement, striking the quarter hours and the hours, two figures to strike the bells and one piper. The wooden wheel clock with figure automatons is a permanent exhibit in the Konrad Kellenberger Collection. 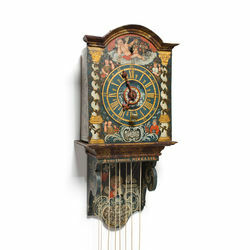 This Appenzell wooden wheel clock by Emanuel Brugger is notable for its rich painted decoration and its unusual height of 88 cm. Painted spiral Baroque pillars with gilt bases and Corinthian capitals appear to stand on the marbled console. They support a segmental pediment. The structure resembles an altarpiece, which constitutes a worthy framework for illustrations and epigrams about life and death. The "memento mori" motif appears on the clock in various forms. The symbolic content and logical sequence of the various illustrations lead one to suppose that the clock was made for a clergyman. Inside, the clock contains unusually large wooden wheels with spokes and inset iron teeth. This type of gearing, which is reminiscent of mill wheels, is extremely rare. Signed Emanuel Brugger, Teufen A.R. 1767. Movement with verge escapement, hour-striking mechanism, alarm, rare type of gearing, locking plate with internal gear teeth, cow’s tail pendulum. The Appenzell wooden wheel clock is a permanent exhibit in the Konrad Kellenberger Collection. 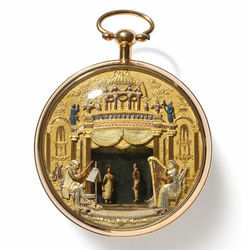 Worldwide, few gold enamel watches with "theatre" automatons and musical works are known to exist. This example features a complicated automaton with a colourfully painted en ronde bosse relief depiction of a couple dancing. The tiny figures start moving as the music plays. They are able to turn, move apart and then draw together again. They can also imitate hopping movements. In the foreground, to right and left, a conductor and a harpist complete the charming scene. 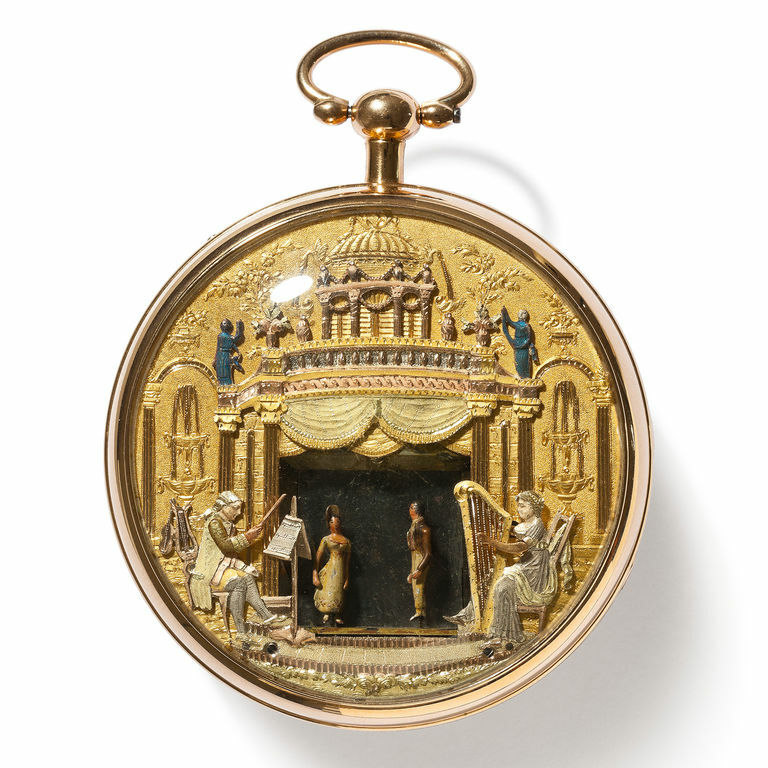 The "theatre" gold enamel watch is a permanent exhibit in the Oscar Schwank Collection. The French Revolutionary Calendar officially came into force on 22 September 1792. The revolutionaries broke with the old order and the Gregorian calendar and introduced decimal time. The year had twelve months of thirty days, each of which had three decades of ten days. The Revolutionary Calendar thus introduced a ten-day week. A day off therefore came only every ten days. Days were divided into ten hours of a hundred minutes, each containing a hundred seconds. The twelve months of the Republican Calendar were divided into four seasonal groups. A number of watch manufacturers built decimal watches accordingly. On most of these watches, the face showed both the old and the new systems of dividing up the day. 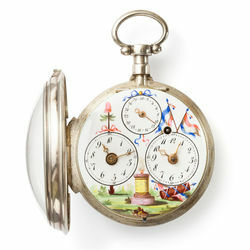 Display for Republican calendar (30 days), decimal hours and minutes, normal hours (1–12) and minutes, crown wheel escapement, balance-spring, fusée-and-chain transmission. 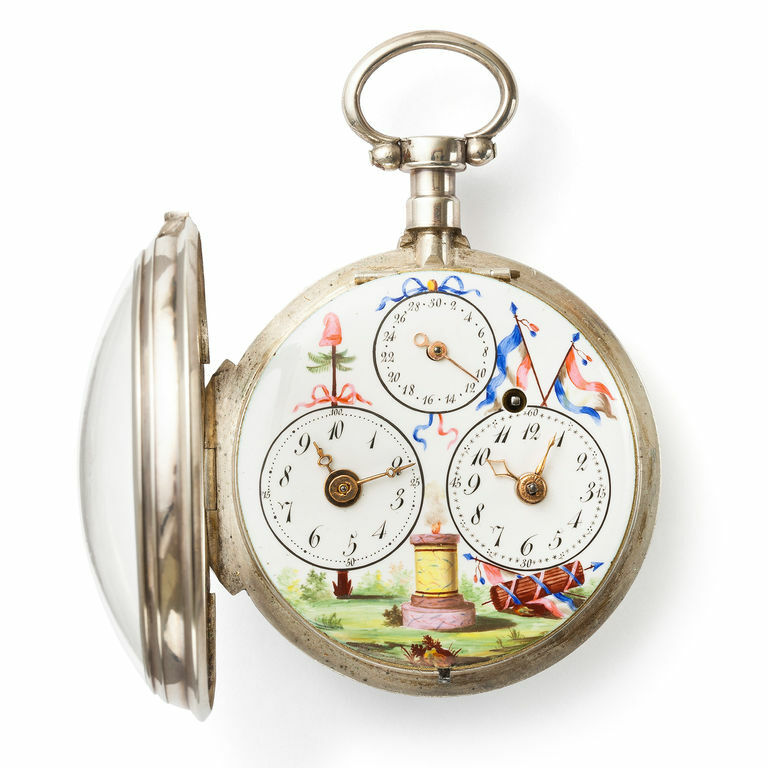 This Revolutionary pocket watch is one of several such watches on permanent display in the Oscar Schwank Collection. This is one of the few Breguet watches featuring this design of hands and dial. The watch also has an early lever escapement. 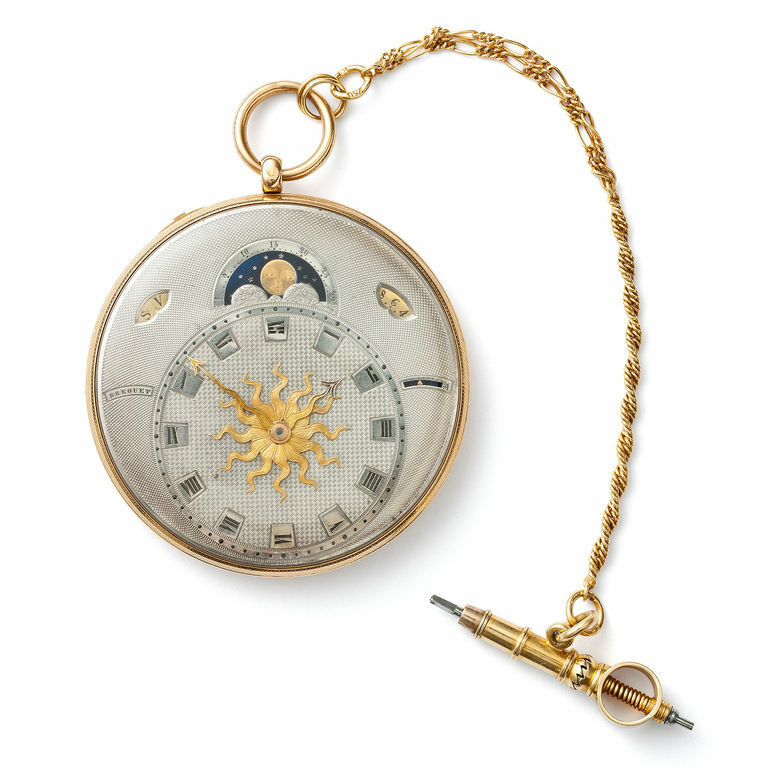 Lord Willoughby purchased this gold watch on 12 July 1830 for 5,000 francs. It remained in the possession of the Willoughby family until 1997. On the death of his father, Peter Robert Drummond-Willoughby (1772–1865) became 22nd Baron Gwydir in 1820. In 1821 he acted as Deputy Lord Great Chamberlain at the coronation of George IV. In 1829 he succeeded to the title of Lord Willoughby of Eresby and took his seat in the House of Lords. 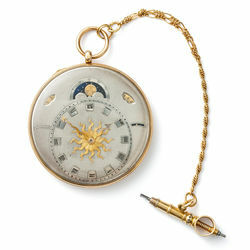 The gold pocket watch is a permanent exhibit in the Oscar Schwank Collection.